Dmitrij Jaskin has had his fair share of ups and downs while with the St. Louis Blues organization since he was drafted 41st-overall (2nd round) in the 2011 NHL entry draft. He’s always used every opportunity he could to learn the North American game, to get better, and more importantly smarter with and without the puck. However, all of this may just be a stepping stone in his career if he can’t find his niche with the Note this coming season, as young up-and-comers and some new vets seem primed and ready to take charge. All puns aside, there are a lot of looming questions Dmitrij Jaskin needs to answer with his play this coming year. Will he be able to find chemistry with teammates outside of Paul Stastny (who was able to experience great success with the young power forward last season)? Will he continue to learn to use his size to dig pucks out of corners and powerfully get them to the net? And will he be able to find a few line combinations to keep himself relevant if and when the young guns like Robby Fabbri come up? These questions are the tip of the iceberg for the 22-year old, Russian-born Czech who is coming into the season more fit than ever, and who is ready to make a difference. He saw his entry-level deal expire this summer, and signed a one-year $772.5K contract, knowing that he has to put it all on the line in 2015-16. He’ll have some veteran competition from players like Scott Gomez and Scottie Upshall, who have both been invited to the Blues training camp on PTOs, and will also need to battle Magnus Paajarvi who signed a one-way deal this summer. The good news is that he seems focused and ready to meet these challenges head on, so we could see a whole new Dmitrij come October. Though Jaskin has continued to improve over his brief time with the St. Louis squad, the road ahead of him doesn’t get any easier. With Robby Fabbri pushing the roster as early as this season, Ivan Barbashev knocking on the door within a couple of years, and new veterans like Kyle Brodziak and the aforementioned players on PTOs, Jaskin has to use this season to solidify his place on the roster. With talks of extending some of the team’s “older core” he’ll also need to stay focused all season to ensure his future with the Note. He’ll need to feed off of his teammates with impressive hockey IQs like Alexander Steen and Jaden Schwartz, so he can continuously dig pucks out and find seams in coverage to aid his team’s scoring in order to accomplish this feat. If he can manage to do this consistently he’ll likely become one of the cornerstones to this Blues offense moving forward. 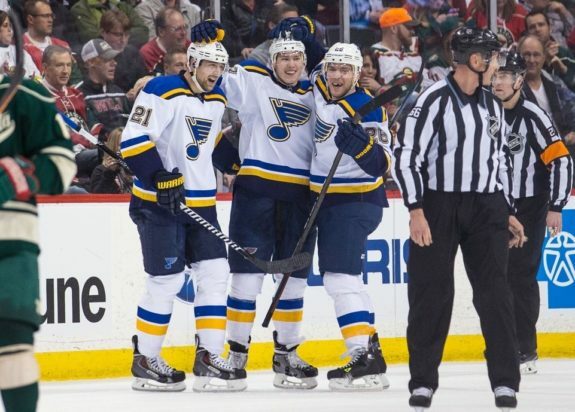 If Jaskin can find chemistry with newcomer Troy Brouwer and Captain David Backes he may be in for a career year, and give the Blues depth that rivals any season. Last year Jaskin played in 54 games, and net 13 goals and 5 assists for 18 points (with a plus-7), but could possibly even eclipse the 30-point plateau as a regular 3rd line winger moving forward. He’ll have the competition to keep him focused and driven, and will have the surrounding support to truly make a difference this season so things are definitely stacked in his favor despite the challenges that lie ahead. Hopefully this season he will return to his powerful AHL form, where he was a .69 point-per-game player (29 P, 42 GP). One thing is certain, fans will surely see Jaskin’s heart come to the surface this year, as Jori Lehtera and Patrik Berglund’s injuries may give him an increased role early in the year, and his one-year contract and team competition will drive him to find ways to produce in every game. This should spell great things from the up-and-comer, and for the Blues in general, so keep an eye out for a breakout year from Jaskin.